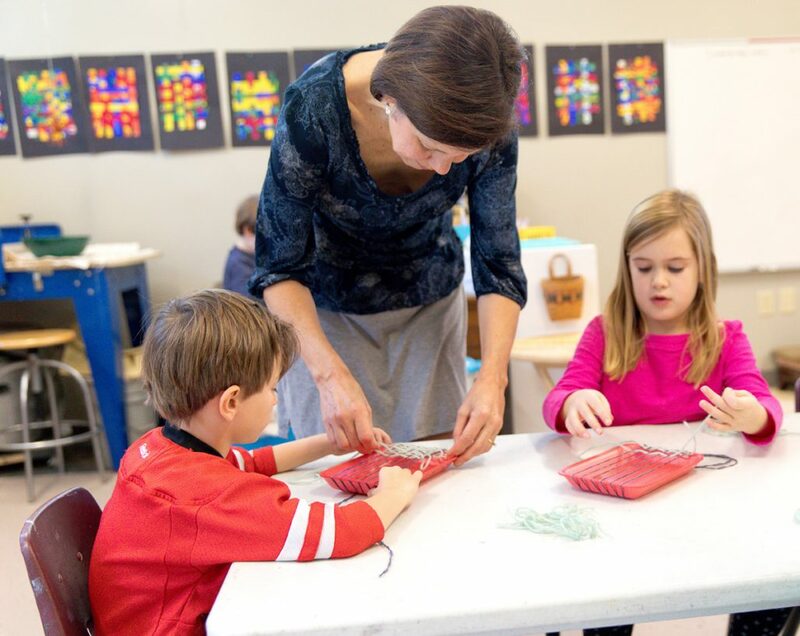 The 6-to 9-year-old class is well-equipped with Montessori materials as the hands-on use of manipulatives continues. Each new concept is presented with materials so that students progress from the concrete experience to an abstract level of understanding in a series of lessons that will enable them to make their own discoveries. Below are the concepts that each student will acquire during their three years in Lower Elementary and a sampling of the topics. Solid Figures – spheres, prisms, etc. Reading Comprehension – We use a variety of resources to practice reading and comprehension. 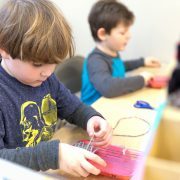 Students are introduced to cultural studies through a series of Montessori “Great Lessons” that expose them to the stories that explain the world they live. When children enter the elementary grades, they move immediately into a further exploration of the cultural areas they learned while in Children’s House. As the “logical, reasoning mind” emerges, the children use the information in new ways, find the interrelationships between and among the various cultural areas, and generally expand their knowledge. Geography – study and structure of the Earth, study of rocks and minerals, solar system, etc. Biology and Zoology – introduction to eras and periods, external parts and vital functions of animal groups, parts and vital functions of plants. History – prehistory, fundamental needs of humanity, measurement of time. 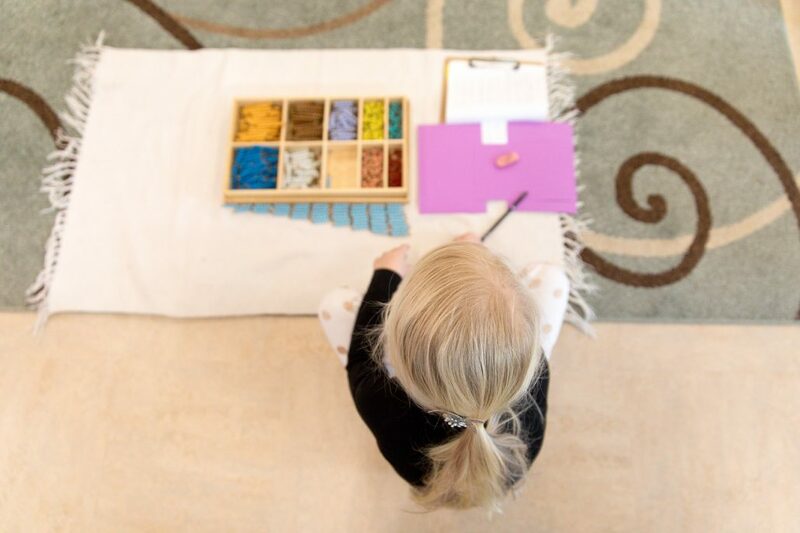 The Montessori educational approach strives to give each child an awareness of the interconnected nature of their studies to the world around them. The core philosophy of the Fine Arts curriculum is process-based (rather than product-based.) Thus, the exploration and development of creative problem-solving skills is more important than the finished product. Students are exposed to a wide variety of artistic tools, techniques, and media. The ultimate goal of artistic expression — to encourage individualism and creativity, while also strengthening emotional development and perceptual ability. The goal and objective of the music program is to instill a joy of music by incorporating an exposure to all forms of music, singing, listening, ear-training, movement, instrument playing, and creativity. Our Montessori music curriculum addresses the needs of the whole child: physically, emotionally, socially, and intellectually. The major goal of the Lower Elementary physical education program is to continue to build the students’ enjoyment of movement and physical activity. The program at this level continues to provide the children with activities that focus on gross and fine motor skills, coordination and spatial relations, and overall fitness and strength building. Sportsmanship and competition are introduced with core Montessori principles such as grace, courtesy, and respect in mind. The “PE Shelf” is also introduced, which allows students to choose independent PE work. School Hours for Lower Elementary (1st through 3rd grade equivalent; approximately 6-9 years old): 8:10-8:30 a.m. drop-off; 3:30 p.m. pickup. After School is available until 5:30 p.m.